Rent Saracens trulli aged 1600 near the sea. They are located in the province of Brindisi, 6 km from Ostuni and 5 km from the beaches of the Oasis of Torre Guaceto. Enjoy the sea views from the garden and the silence in a hammock at the foot of the olive trees. The accommodation has 3 bedrooms and 6 beds: 1 double room in the main building and a sofa bed in the living room-kitchen. Outside, at 5 meters, there are also 2 Trulli, in one there is a double bed with TV, in the other, separated from this, 1 single bed. Guests can enjoy sea views, have access to the botanical garden with seasonal vegetables produced without using poisons and may approach the 2 tame donkeys. Those who rent Saracens trulli benefits from the healthy effects of country life, silence, contact with animals, direct access to the products of nature and aromatic spices such as sage, rosemary, basil and bay leaves are useful for tea and roasts . Details: Oasis of Torre Guaceto is 5 km away - is a nature reserve protected by the State - a long sandy beach totally free and secure parking. Access to the bar is free while those who love equipped lido has a wide availability of umbrellas made by hemp. SPORT: snorkeling, kite surfing, excursions with electric bikes take place every day at Apani and Torre Guaceto. Reservation recommended at your arrival. OSTUNI is the first tourist city in 10 km while Alberobello, Castellana Grotte, Polignano a Mare, Taranto and Lecce are within 70 km. SUPPLIES: within 1500 m there is Carovigno known for strong vocation of the taverns, typical cuisine, certain restaurants are also awarded with star in the Michelin Guide. TO VISIT: 10 km Ostuni, 25 km Brindisi, 15 km Ceglie; 30 km Cisternino and Locorotondo (villages of Itria valley recognized as being among the most beautiful in Italy) 40 km safari zoo in Fasano and Martina Franca, Alberobello 50 km, 60 km Lecce and Polignano a mare the city of Mr. Volare. Pet Therapy: the whole property is composed by three houses, two of them have access to two different gates. In the garden there are sweet labrador, on request, the owner, makes pet-terapy. Instant delivery to Brindisi airport. We loved it. The 3 dogs were the highlight, our kids played with them all day long. The house is a compound of 3 buildings with 5 beds and 1 bathroom. 1 room is inside the house and 2 trullis are next to the house. It's a big property with an organic garden, fruit trees and lots of olive trees and the owners are very nice people. It is a 10min drive to the beach. 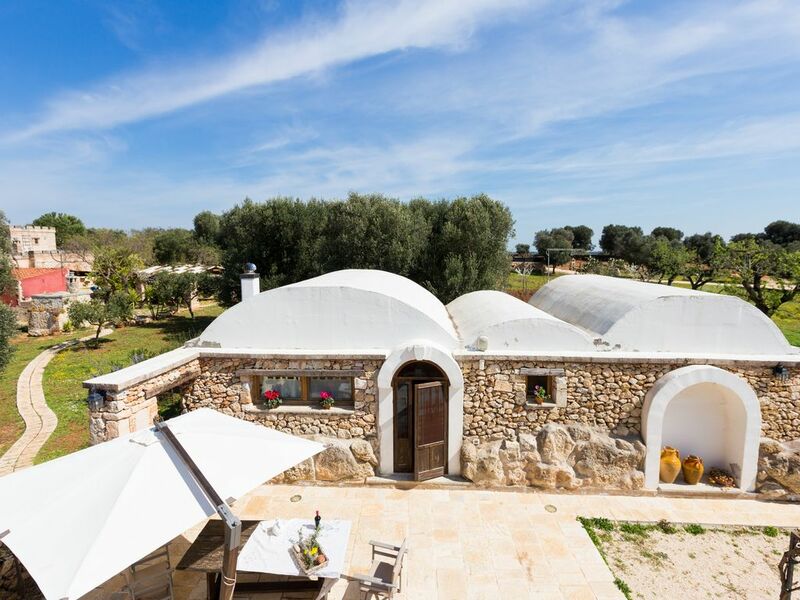 thank you for your time to share your beautiful experience in Puglia in this typical Trullo. We've been very happy to meet you all and we'd like to thank you for chosing us. Trullo suggestivo e ben attrezzato. Bellissima proprietà, immersa nel silenzio! Ottimo luogo per rilassarsi in completa armonia con la natura. L’orto e gli alberi da frutto disponibili per il consumo dei clienti sono una chicca che rende il luogo unico nel suo genere. speriamo di riavervi nostri ospiti. Thank you for having been with us! Wir hatten tolle zwei Wochen in einem wunderschönen Trulli-Ensemble. Liebevoll eingerichtet, riesiges Anwesen, ein perfekter Urlaub! Appena rientrati da una vacanza bellissima presso "trullo dell'Angelo". Ci sono state vacanze anche più lussuose dove nonostante stessi benissimo ad un certo punto avevo nostalgia della mia casa. Qui stranamente mi sentivo a "casa mia". Un ambiente semplice ma pieno di tanto affetto e di sapori, dall'albero del carrubo, del mandorlo all'orto bio, e poi ancora proprietari gentilissimi ed uno staff di grande professionalità sempre presente nel momento del bisogno. Io come mio marito, abbiamo lasciato in quella tenuta, parte del nostro cuore e ci siamo ripromessi di ritornarci per le ferie di Pasqua. Grazie di cuore! Consigliato a famiglie con bambini. Location affascinante nel mezzo della natura. Ambiente caldo e familiare. Troppo carini gli animali presenti dai cani agli asinelli, uno spasso per i bambini. Abbiamo visitato tanti posti e assaporato degli ottimi prodotti tipici Pugliesi dalla semplice "frisa" con olio d'oliva e pomodoro ai raffinati piatti di pesce fresco. Consigliato. CAROVIGNO is known for its numerous typical cuisine restaurants, some of them starry Michelin. Including 'La Loggia', 'Gia' sotto l'arco', 'Creatività'. To visit: the Castle of Dentice di Frasso known for the particular form in 'almond', the only one in Italy to have this awesome shape; the Sanctuary of Belvedere stage of the faithful to Sunday Mass and the millennial olive grove at 5000 mt in Borgata Serranova. Stop here for souvenir photos, you are of in 'Golden Road Park '. We recommend the purchase of oil produced by these trees on the nearby farm 'Calemone'. Here over the oil we recommend the purchase of the tomato 'semi-dry' added in the chain 'Slow Food'. This product is stored in jars with bio-oil and without the addition of any preservative. At 7000 meters you have 3 partner restaurants. 15% off for you. For sport lovers the center visits of Torre Guaceto is 10km. From here you can practice the immersion of the seabed suitable for children ages 12 and up, the hike in the marine park and behind the dunes on foot or by bike with pedal assistance. Carovigno is a typical village of the Valle D'Itria, thus known for his vocation to the typical starry gastronomy and its exceptional location, it's from here that your exploratory trip begins. Make a list before leaving. It will be difficult to discover them all. And so: within 10 minute drive, Natural Oasis of Torre Guaceto, 7 km the ancient village of San Vito dei Normanni, 6 km Ostuni the Citta' Bianca', 20 km Brindisi and its airport , 30 km Locorotondo, Cisternino, Ceglie, 40 km the forest, the Fasano Zoo, Martina Franca, Alberobello at 50 km and 60 km Polignano a mare the city of Domenico Modugno. To name a few. 1) the renowned dairy with visual laboratory 'Lanzillotti' known for the high quality of the raw material earning the presence in the principals 'Slow food'. Well-known is the cottage cheese, curd, the pampanella (fresh cheese) then the stracciatella, burrata cheese, caciocavallo, scamorza, cacioricotta. 2) The pasta factory 'Il Mattarello' known for the production of orecchiette with valuable local flour 'Senatore Cappelli' and for the production of 'panzerottini' Puglia, to fry with fresh mozzarella and tomato. Ask to those slightly piccantini. 4) ANTIQUA: Every first Sunday of the month takes place the antique market: From 7 to 20, 1000 square meters open to exhibitors from around the Salento: experts antique, vintage lovers, sellers of books and comic books used, of objects traders modernism and leather.